Every college football fan knows of Clemson Tigers Head Coach, Dabo Swinney. He's one of those guys who can be counted on for a great sound bite after a game. There are also videos of him all over the internet, where he's showing off his dance moves in the locker room after a Clemson victory. He is also the coach of Alabama's latest national title game victim. Not a lot of attention typically gets paid to the team or the head coach of the team that loses the national title game. The Clemson University Board of Trustees decided to take action in order to make sure it stays that way. They decided to show him some love. Love in the form of more money, that is. The University recently announced that it has rewarded Swinney with a new contract, a six-year deal worth $31.75 million. His pay will jump up to $4.55 million next season, making him the second highest-paid coach in the conference, next to Florida State's Jimbo Fisher ($5.15 million). He'll get a raise in each year of the contract with a max of $5.65 million in its final year (2021). His base salary, which is what the state pays him, on his new deal will be $245,000. The remainder of his salary will be paid primarily from the school's athletic support fund, ITPAY. He can earn as much up to $1.625 million more depending on how well the team does and if he wins any awards. Last season, he earned an additional $800,000 because of certain incentive clauses. Should he still be the head coach on New Year's Day in 2019, he'll earn a $600,000 retention bonus and another bonus of $400,000, if he is still the head coach on January 1, 2021. Swinney will also receive an $800,000 licensing check for each of the next six years. "This new contract was important for us not only for what Dabo has accomplished in his eight seasons here but for what we know the program will continue to achieve – both on and off the field – for the foreseeable future," athletic director Dan Radakovich said in a release. Swinney had been awarded a new contract after the 2013 season, and with it, his pay jumped from $2.2 million to $3.15 million in 2014, with a pay raise to $3.3 million in 2015 and $3.45 million in 2016. So, with scheduled pay raises already in place, why give him another one? That's easy to answer: the school board wants to make sure Swinney doesn't go anywhere, anytime soon. By giving him a pay raise, they force anyone thinking about stealing him away to have to offer him even more. However, even if they do, it will not be that easy to get him, because he also comes with a rather expensive buyout clause that must be addressed. 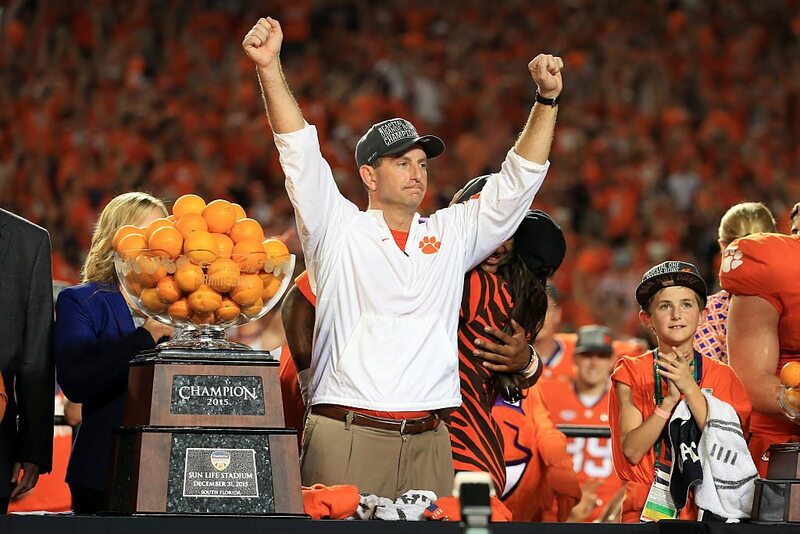 Should Swinney want to leave for another school after next season, he – or his new team – will have to pay Clemson $6 million to buy out his contract, which is $1 million more than his old contract had required. However, should he leave Clemson for the NFL, he (or his new team) would not owe the school anything. While the new contract makes it harder for Swinney to leave, it also makes it harder for Clemson to get rid of him. If the university tries to fire him without cause after either of the next two seasons, it will cost the school a $20 million early buyout. That number drops down to $18 million in 2018, $14 million in 2019, $9 million in 2020, and $5 million in the final year of the contract. Clemson's Dabo Swinney just became one of the wealthiest college football coaches after last season's amazing championship win. No one may have been happier than Clemson head coach Dabo Swinney after his Tigers won the college football title. After all, it earned him a lot of money.